Yaacov-Hirsh , my oldest brother made the decision. We are returning to Vishnive. The year is 1920. Five Vishnivean families made arrangement to return jointly. We rented a train car to carry all our belongings. We packed our pillows and blankets, clothing and housewares, and several sacks of tobacco. We loaded this on a horse and wagon and brought it to the train station. I loved Vichodnitza, in spite of the hardships, because of the feeling of freedom, the leisurely atmosphere, and the abundance of nature's goodness. It was spring. The fields are getting green. The villagers are ploughing the land. A stork is nesting on top of a pole. We said good bye to our gentile neighbors with whom we had lived for four years. We said farewell to the "Yishuvnik" and his wife. Then all the five families met at the train station. Each bearded man covered his face with a shawl as if he had a toothache. Why? We heard that the "Pilsutzkis" (Polish soldiers) were catching any bearded Jewish man and cutting off half the beard. Who would dare saying No to them? We waited for a very long time. Just as the noisy train was slowly approaching, a company of Polish soldiers arrived at the station. We checked that all of us, including our "peklachs", were there. The train stopped. We began climbing on and loading our rented car. Suddenly the Polish soldiers drove us out because they needed the car. Scared, disappointed and upset we got off the car. What are we going to do? The children are already thirsty and hungry and we are still at the station. The train began moving slowly, leaving only a trail of white cloud behind. Near the railroad there is a well of dirty water, but the pail had sunk. The families finally decided to travel by horse and wagon. It took us a full week to reach Vishnive. At that time military skirmishes between Russia and Poland were still going in this area. These skirmishes had begun following the withdrawal of the German army in 1918 and lasted until 1922. During that period, Vishnive changed hands several times. Finally, in 1922, after the peace agreement, Vishnive was included within Poland's boundaries. We arrived after Passover, 1920. There was no water, no bread and no "bulbes" (potatoes). The soil was mixed with gravel and sulphur so that even grass would not grow .The smell of sulphur was everywhere. The trees were poisoned by lead. Each tree was dotted with lead bullets stuck all over. The bullets looked like "Gulgalachs" (little round balls). The center of the town, where the market place used to be before the war, was covered with trenches. Many modernly built "Bunkers" (shelters) could be found in town as well. These "Bunkers" were equipped with electricity, toilets, kitchens, and first aid stations. Temporary soldier graves, located by crosses on top, were all over the place. Some corpses were only partially buried in shallow graves where feet could be seen sticking out. Human bones were scattered around. Later they were collected and buried. Much of the town was destroyed. Local gentiles initially settled in the trenches and bitterly complained about being neglected by the Polish government. 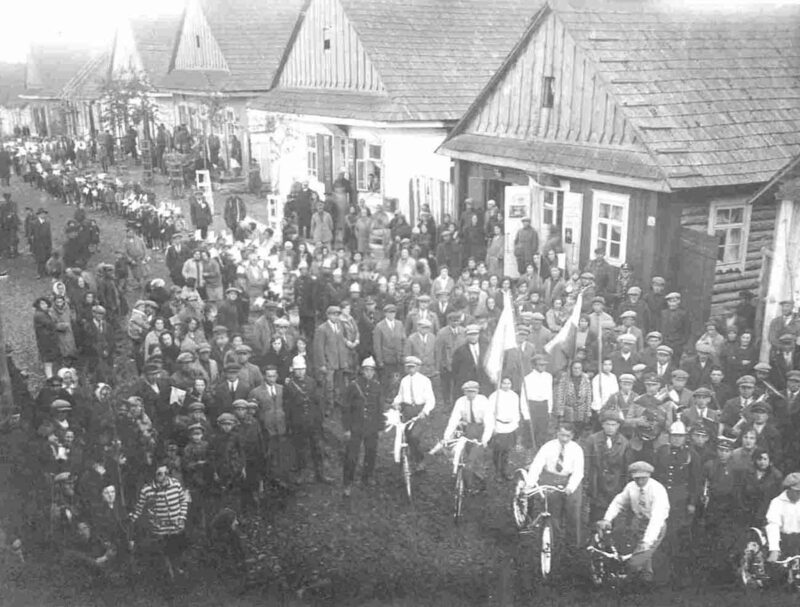 A few Jewish families who had stayed through the entire war in nearby shtetls returned as early as 1917 or 1918 and began rebuilding their homes. There was a severe shortage of builders, carpenters and other handymen. It took a long time to get started. Before our arrival, we had been told about several apartments located at the outskirts of town which had not been destroyed. Presumably we could get one of them. When we arrived, we found there were "no bears and no forest", and nothing was available. We were desperate. Mother broke down crying about Father's death, our burned house, and the lack of food. Finally three families: us (Elishkevich), Levin and Podboreski, settled in a small house that used to be a stable with an open wall on Volozhiner Gas (street). Yaacov-Hirsh, Leibl, and the sons of the other families cleaned the stable of all the horse manure and dirt. They also closed the open wall with lumber. They built beds, mainly for the little kids, and some beds for the parents. The beds were made of flat wooden planks on the floor with straw-filled sacks on top. Since there was not enough room in this house, the neighbor, David-Hirsh Elishkevich, permitted the older boys, including Leibl, to sleep in his barn. Yaacov-Hirsh, who was dating Teibl at that time, slept at her parent's house. Cooking was done outdoors. To boil eggs, I used to go to the mother of my future husband, Mordechai (Rogovin). His family had returned to the shtetl before us. Their home located at the end of Volozhiner Gas (street) remained intact. In the meantime, winter was rapidly approaching. We could not live like this in the winter. What could we do? Mother was a friend of the Volozhin Rabbi's wife. Their son had a wood cutting shop in Vishnive. He was a good friend of Teibl and Yaacov-Hirsh. He was renting a 3-room apartment. The apartment was in the mansion of the District Governor. It had been built before WWI. It was a new, big and very beautiful building. The Rabbi's son gave the apartment to my Mother, Sara-Dvora. The building was very big and long. It contained 20 rooms. There were many tenants. We were the only Jewish family there. In the yard there was a house that served as a kitchen. Mother did not use it so that our kitchenware wouldn't get mixed with that of the gentile neighbors and cause Non-Kosher cooking. She cooked inside our apartment on a cooking plate attached to the ceramic heating furnace. Pop and Papiche were the very old parents of the Governor's wife. They were the landlords and made their living from the rental payments. A portion of the mansion was rented to Andre Vonja Kondretzki. Andre was a relative of the Graf. His most obvious quality was being in a constant state of drunkenness. Another neighbor was a mechanic who worked in a locksmith shop. All the neighbors were Russians. During our stay in this residence, we began rebuilding our own house. At this time, Yaacov-Hirsh married Teibl, and they went to live in their own house near the market place. Andre Vonja, the drunkard, decided to travel to his hometown in order to bring his old mother and all of their belongings to his residence. There were rumors that his mother used to be a Jewish beauty. During his absence, his portion of the house was converted into a Belarussian school. He was left with a single room. We had to give a room to Anthony Satzka, one of the school teachers. Satzka was also the "Nachalnik Post" (Post Office Manager). He was a very educated person. He knew nine languages and it was always a pleasure talking to him. Andre brought back his mother and all of their belongings. When he understood what had happened he went nuts. He ran to the kitchen, grabbed a big knife and said that he was going to slaughter Satzka the teacher. This caused an immediate panic. All the neighbors were fearfully watching. Andre was yelling, "I'll cut your throat." Satzka was standing there bewildered. My brother Leibl was standing in the middle trying to calm the drunkard, all the while saying, "Pan (Master) Kondretzki, Pan Kondretzki……" until he relaxed. I was absolutely panicstricken. The knife and the murderous appetite shocked me. What did I do? I fled to my brother Yaacov-Hirsh's house. I knocked on the door and told him, "I'm terrified. I am not returning there. There are murderers there. I don't want to be there." I ended up staying there permanently. Yaacov-Hirsh and Teibl were very good to me. I had excellent relations with them. Any friction with Teibl would be immediately forgotten. I gave her some trouble about food. I was not a good eater. However, with "A Bisele Trern" (few tears), everything would be settled. Our family was very cohesive. No secrets would go out of the immediate family circle. We loved each other. We were happy together, and we were grieving together. What Happened to the Rest of the Family? In spite of Mother's separate cooking, the sons of Pop used her kitchenware. This was the straw that broke the "Jewish tolerance" back. Mother really suffered because her kitchenware became "Treife" (Non-Kosher). She said, "What? Will I go to hell?" In mid-winter, 1922, Mother, Leibl, Rachel-Lea, Rivka and Gitke moved into our not yet completed house. Since the windows were not fully built, they covered the holes with sacks, blankets and tablecloths. They had to sit all day around the iron heating furnace. It was very difficult to find builders since every family was building its own house and everybody suffered. Mother made a vow that when her house was complete, she would bake Matzos for all. Indeed after two years she fed the whole shtetl. Since Father's death from Typhoid in Vichodnitza, Leibl took his place and carried all the family responsibilities on his back. He helped Mother raise my sisters (I lived with Yaacov-Hirsh), and helped in making a living for the family. We had about one and a half acres of land near our house where we were growing vegetables, potatoes and rye for our family's consumption. Leibl also rented additional land and would sell the crops to make the family living. Leibl was a handsome man. He was also a good brother and a dutiful son. I think he was overly good. He managed to finish building our family's home and to marry off my oldest sister, Rachel-Lea. This gave him a lot of satisfaction. In his free time he used to study Talmud and Mishna in the synagogue's study groups. Whenever I think about him my heart is crying.